Pvc sheet is used for for chemical storage tanks, towers, oil tanks, and photographic developing instruments. In case of fires, this material is self-extinguishing. Easy to fabricate and has strong glue joints. Can be painted and screen printed. <?xml:namespace prefix = o ns = "urn:schemas-microsoft-com:office:office" />PP sheet are widely used in chemical industries, anti-corrosion project, water purification, environment protection equipment, electronic etc industry .such as structural tanks and covers, tank linings, plating barrels and tanks, vacuum forming all kinds of parts and trays ,artificial limb etc. pickling tanks. 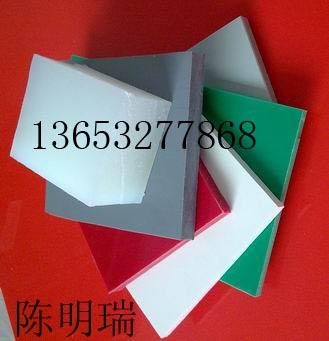 pp sheet may be customized by adding reinforce material(glass fiber), fire resistance and filling modification material(calcium),such as FRPP sheet and Calcium-added pp sheet etc.